In a large pot of boiling, salted water, cook the pasta until al dente; drain. Meanwhile, in a large, heavy pot, heat the olive oil over medium heat. Add the chorizo and cook, stirring, for 2 minutes. Add the garlic and cook until golden, 2 to 3 minutes. Increase the heat to high, add the wine and clams, cover and boil. Stir occasionally and, as the clams open, transfer them to a large bowl. Add the tomato sauce to the pan and boil for 10-12 minutes. Lower the heat to low, add the pasta to the sauce and stir to combine. 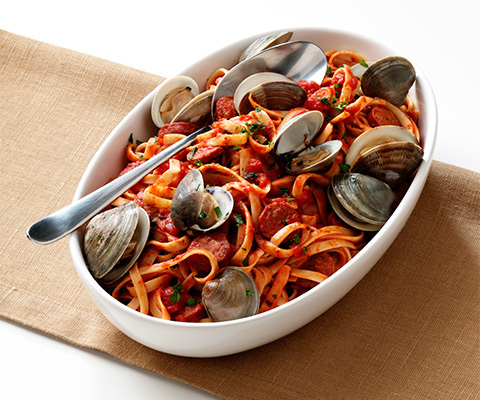 Divide among 4 shallow bowls, add the clams and sprinkle the parsley on top.